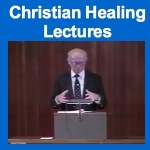 Here are five talks given by Ed Rabel on Charles Fillmore's book Christian Healing. The total time for the talks is four hours thirty-seven minutes. Because of illness, the fifth lecture was cut short and he was not able to wrap-up with a sixth lecture as he had planned. When you listen to the first 15 minutes of the first talk then you will know why these talks are important. Ed explains that when he came to study at Unity in the late 1940s and early 1950s the place was filled with people who had been directly taught by the Fillmores. Those people passed on stories and shared their notes. In this series of talks, Ed Rabel passes on their stories and their notes to you and me. So these talks aren't so much an introduction to Christian Healing as they are a passing on of the wisdom of the Fillmores. Ed Rabel comes from what is commonly called "2nd Generation Fillmore." There are only a few of them left. Look at this 1958 ordination photo; do you see Johnnie Colemon, Ed Rabel and Catherine Ponder? It was a good year, wasn't it? Now much of the content of these lectures are Ed Rabel's new perspective on classic Unity. But he returns time and again to passing on the Truth he had been taught. If you like what Johnnie Colemon and Catherine Ponder have done with classic Unity, then you will enjoy these talks by Ed Rabel. This video and much other material here on TruthUnity came to me from a 3rd Generation Fillmore who, for decades, has collected resources and studied Truth as taught by Unity's great teachers. I hope you are as grateful as I am for this person passing on what he has received. I pass on to you the video. You and your church are part of the passing-on of Unity's great teachings. I am sure that one of you who is reading this will download the videos and write-up detailed lecture notes to share with your friends in Unity. I am also sure that some of you who teach Unity will download these talks and incorporate them into your classes and lessons. These talks by Ed Rabel take us to a time much closer to the Fillmores. In these talks we find a reverence for the tradition and the way it took root in early Unity. When we work together to pass on the wisdom of the Fillmores then we, together, will have manifested what Paul wrote many years ago, "I pass on to you what I have received."